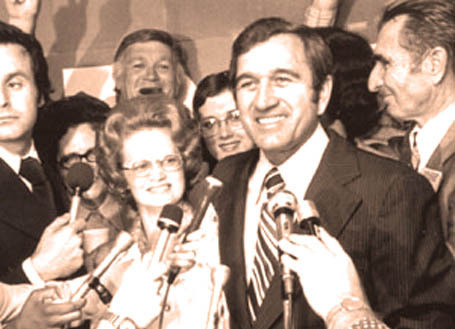 A former member of the Tennessee House of Representatives, Blanton was elected Governor in 1975. He came under significant pressure after he pardoned a convicted double murderer whose father was later found to be a county chairman for Blanton. With the unlikelihood of winning reelection, Blanton, a Democrat, decided not to run, and Republican Lamar Alexander was elected his successor. Near the end of his term, three state employees -- two from Blanton’s office --were charged by the FBI with extortion and conspiracy to sell pardons, paroles and commutations. Blanton’s most serious acts of corruption occurred just shortly before his term was to expire as pardons were delivered for 24 convicted murderers and 28 prisoners of other crimes in what many believed were performed in exchange for money. To stop Blanton’s pardon spree, the Lieutenant Governor and State House Speaker claimed the state constitution was unspecific as to when a newly elected Governor must be sworn in. As a result, Alexander was sworn in three days before his scheduled inauguration to get Blanton out before he could pardon anyone else. Fred Thompson became famous when in 1977 he represented Marie Ragghianti who had tried to inform authorities of the corruption taking place while she served as chairwoman of the state’s Pardons and Paroles Board. She was fired by Blanton but sued for reinstatement and won. The story was made into a book and later a film (“Marie”), in which Thompson played himself, launching his movie career.